Here’s what’s up in the world of TV for Tuesday, July 12. All times are Eastern. Lost World Of Pompeii (Science, 9 p.m.): History and archaeology buffs should be in for a treat, as this new documentary looks at the cutting-edge technology being used to learn all there is to know about the ancient city that was buried by Mount Vesuvius’ eruption in the year 79. The scientists and researchers are in a constant race against the clock as the site is under threat from landslides, future eruptions, and the constant presence of tourists. Plus, for those who can’t get enough Pompeii, the 2011 documentary Pompeii: Back From The Dead is airing an hour beforehand on the same channel. The White House: Inside Story (PBS, 9 p.m.): In case you feel Lee Daniels’ The Butler didn’t already say everything there was to say on this topic, here comes a two-hour documentary on life behind the scenes at the White House. There are interviews with Barack and Michelle Obama, Jimmy and Rosalynn Carter, and Barbara and Laura Bush, plus more from employees, historians, and journalists. MLB All-Star Game (Fox, 8 p.m.): As far as all-star games go, this is one of the better ones (keeping in mind that the NFL’s Pro Bowl is quite possibly the apotheosis of tedium). There’s a decent argument that this has always been the one legitimately important all-star game. In the years before interleague play, this was the one opportunity outside of the World Series to see players from the American League and the National League square off, and now there’s that pretty doofus rule that the winning league gets home-field advantage in the World Series. So, okay, maybe it’s not always important for good reasons, but hey, baseball has a lot of young, fun superstars at the moment, so this could be worth a lazy July watch. Difficult People (Hulu, 3:01 a.m.): The second season kicks off with a double feature of episodes, as successful New York comedians Julie Klausner and Billy Eichner return to the roles they were born to play, aspiring New York comedians Julie Kessler and Billy Epstein. You know, we just realized how much we enjoy that delightfully retro trope of slightly altering the protagonists’ names from that of the stars. Let’s go get Tony Danza an arc on this thing! Maya & Marty (NBC, 10 p.m.): We’re not sure if this season finale also marks a series finale—though it’s a summertime variety show on NBC, so that feels like a decent enough assumption—but we do hope this show comes back, if only so we can keep alive the dream of Maya Rudolph convincing her partner Paul Thomas Anderson to direct an episode, because we’re curious what the hell that would even look like. Anyway, tonight’s guests include Sean Hayes, Steve Martin, Kelly Ripa, and Emma Stone. To Tell The Truth (ABC, 10 p.m.): One of the guests in tonight’s finale is the person with the longest fingernails in the world, which we really hope is still the same guy we vaguely remember from those photos in the 1996 or so edition of The Guinness Book Of World Records. That guy seemed like he had things pretty well figured out. Next Tuesday sees the premiere of the new, live edition of WWE Smackdown, bringing to a close (at least for now) 17 years of pre-taped episodes. So then, let’s pay our respects by showing the highlights of quite possibly the greatest match in Smackdown history, Kurt Angle and Brock Lesnar’s 60-minute Iron Man match for the WWE Championship. “The Fires Of Pompeii,” Doctor Who (Amazon): Let’s stick with the Pompeii theme a little while longer with this damn good fourth-season Doctor Who episode, which took on greater importance when featured guest star Peter Capaldi took on the title role. (It’s also got Karen Gillan in a small role as a soothsayer, so it’s basically a glorified show reel for future series stars.) 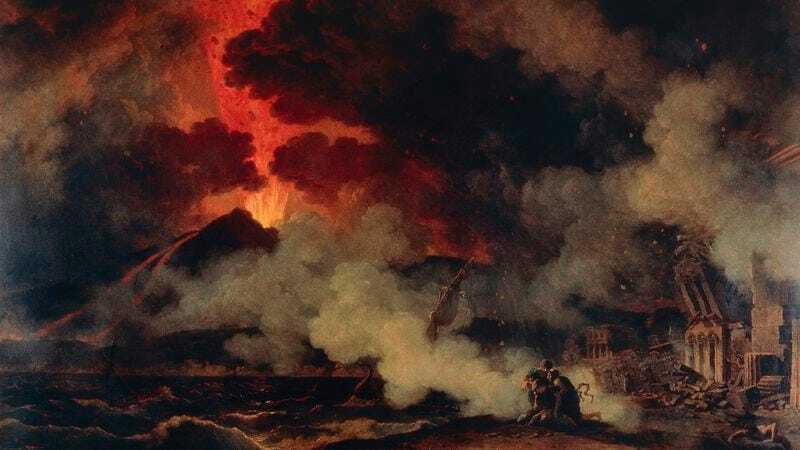 Anyway, this is a great episode about the emotional costs of time travel, and it does a decent job depicting the eruption of Vesuvius on a tiny BBC budget.